St Joseph’s Cathedral Parish in Miri is organizing a walkathon to raise funds for the new Cathedral. We are all encouraged to support this project. Walkathon cards have been distributed to various HCG leaders. Do get a card from them. This year’s WORKING YOUTH CONFERENCE will be held in Bintulu in August. Registration can be done after Mass. The Catholic Welfare Services would like to thank all parishioners who donated generously to the Lenten Appeal. 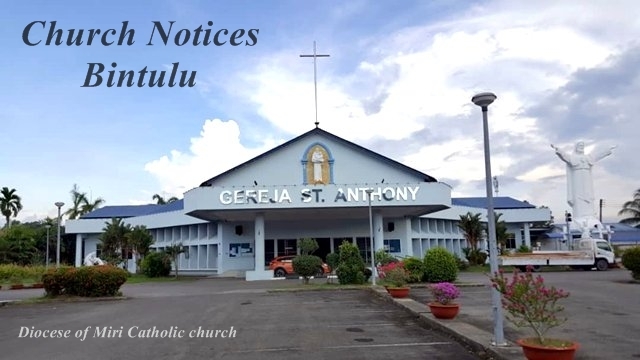 Our Bintulu Parish collected a total of RM57,101.30. Parishioners who had asked for receipts can collect these receipts from the Parish Office during working hours. The next Infant Baptism (in English) will be on Saturday 22 July. Parents are urged to register early with the Parish Office. Sunday School reopens today. Teachers and parents please take note.